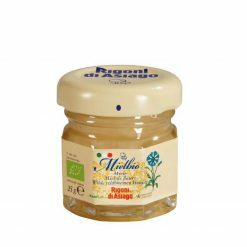 This traditional multifloral honey from northern and central Italy has all the flavour and aroma of a variety of wild flowers. Mielbio Organic Wildflower Honey is organic, gluten free and contains no genetically modified organisms. It is delicious on wholemeal bread or toast, and great as a sweetener in yoghurt or tea. The low temperature process patented by Rigoni di Asiago enables vitamins, minerals, enzymes and organic acids naturally present in the honey to remain intact, as well as its natural anti-bacterial and antibiotic properties. Thanks to this process, Rigoni di Asiago Honey is defined as raw. Honey also comes from Rigoni di Asiago’s trusted beekeeper partners. Located in protected and unpolluted areas in several Italian regions, the beehives are checked regularly to guarantee a flawless organic quality. They do not undergo any chemical treatment. As a result, bees are able to develop in a healthy environment covering several kilometres. In-house inspections are carried out throughout the manufacturing process, while an independent and authorised certification organisation not only checks the honey but also the quality of the entire process, from production locations to storage facilities for the finished product.